There's few things as quintessentially British as a cream tea. Fresh scones (however you decide pronounce it! ), thick clotted cream & sweet jam - it's a pretty simple combination but one enjoyed by thousands of people all around the country. Add a lovely bit of sponge cake and some nicely cut finger sandwiches (no crusts!) and you have the perfect excuse for whiling away the afternoon in the most sophistiated fashion. 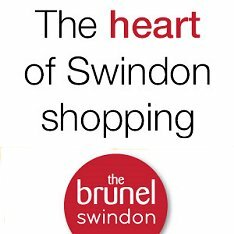 And here's the best places in Swindon to do just that. Traditional English tea with homemade scones & cream and jam from the village. Bookings need to be made a day in advance as all items are freshly made to ensure the finest quality. When the sun is out there are few better places to enjoy freshly baked scones with local clotted cream and handmade jam than at this beautiful setting on the edge of the Cotswolds. 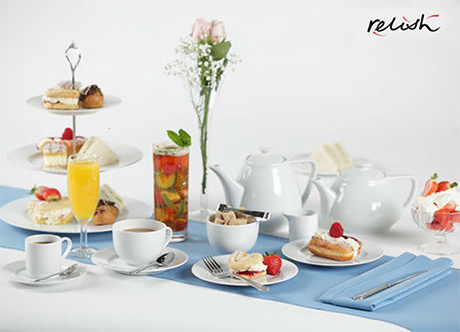 Satisfy your sweet tooth with fruit scones with cream and jam and an assortment of deli cakes at Relish at The Gateway, situated on the edge of the stunning Cotswold Water Park. Served from 2pm to 5pm everyday except Sunday. Must be booked in advance. A cream tea with a lakeside view. Perfect. Another fantastic setting for tea & cake in West Swindon. 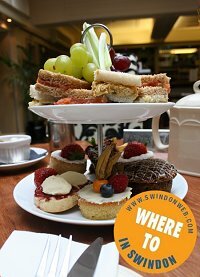 Enjoy a cream tea while surrounded by the glorious history of the GWR. (Cafe open to non-visitors of the museum). Enjoy a homemade scone with artisan jams and clotted cream at this unique four star family owned hotel in Wiltshire.